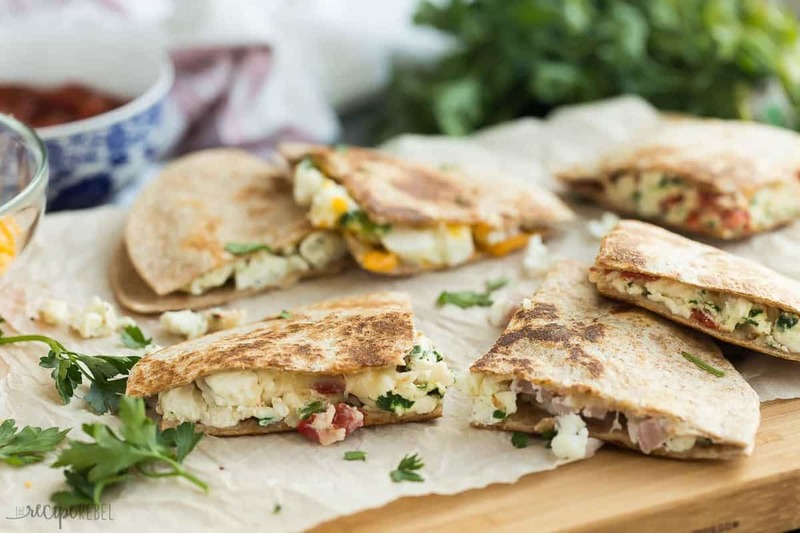 These Make Ahead Breakfast Quesadillas are the perfect healthy breakfast, lunch or dinner! They’re easy to make for your week’s meal prep, freezer friendly and totally customizable. A step by step recipe video shows you 4 different ways to make them: Broccoli Cheddar; Three Cheese Pesto; Roasted Red Pepper, Spinach and Parmesan; and Denver. *This post and video is sponsored by Burnbrae Farms. Thank you for supporting the brands that keep us fed! So many of my favourite things are happening right here, you guys. We are big fans of breakfast and brunch and brinner, and we’ll eat eggs for any and every meal of the day. Since little Stella joined our family mid-November, I took the rest of the year off just to rest, connect with family and friends, and eat good food. I baked up a storm, and thoroughly enjoyed my stash of brownies and cookies and bars and cheesecake in the freezer right through the end of the year. But now that January is here? I’m excited to get back on track. I’m working out again (it ain’t pretty, friends, but it’s happening), and we are back to (mostly!) healthy eating. We eat a ton of eggs because they pack a ton of protein and other awesome things, plus they’re easy to cook up and the kids never complain about having to eat them. These breakfast quesadillas? They’re going on the meal plan regularly. I know some people wonder what exactly is in the carton or what is added to the eggs — and the answer is nothing! They are real, pasteurized egg whites that have been cracked and separated for you, making it even easier to choose healthy eats (and no waste!). Find more healthy recipes for the New Year here. I highly recommend using a whole grain tortilla for an extra boost of fiber and protein! 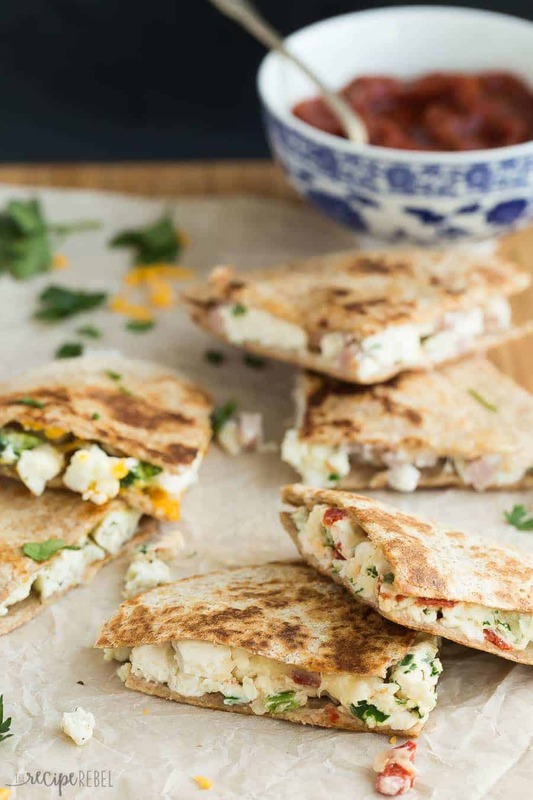 It will give these quesadillas extra staying power and keep you going throughout your day. Feel free to mix up the filling! Add extra veggies, turkey sausage, or cheese, cheese, and more cheese. The options are endless! If you’re going to be waiting a few minutes before serving, I like to place the quesadillas on a paper towel lined plate to keep them from getting soggy. They will also hold together a little better if you give them a few minutes to rest! 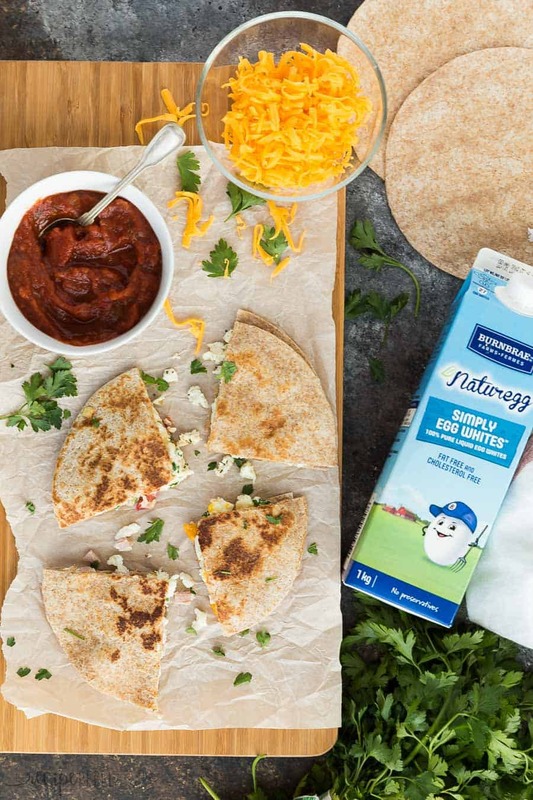 To freeze these Breakfast Quesadillas! I recommend wrapping each quesadilla individually in plastic wrap, then placing together in a large freezer bag to freeze. To reheat, you can either thaw in the fridge overnight (in the plastic wrap) and crisp up in a hot pan in the morning, or you can microwave on low heat to thaw, then crisp in a pan. You can heat to eat in the microwave, but I love my quesadillas a little crispy on the outside, so a hot pan is best for that. If you want to heat in the microwave, I recommend unwrapping and placing on a paper towel lined paper to soak up any excess moisture. 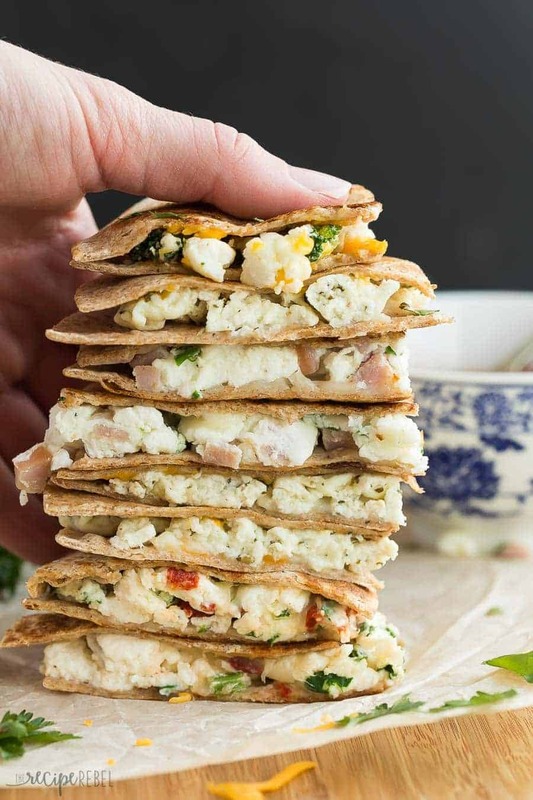 These Make Ahead Breakfast Quesadillas are the perfect healthy breakfast, lunch or dinner! They're easy to make for your week's meal prep, freezer friendly and totally customizable. A step by step recipe video shows you 4 different ways to make them: Broccoli Cheddar; Three Cheese Pesto; Roasted Red Pepper, Spinach and Parmesan; and Denver. Lightly spray a small skillet with non-stick spray. Add 1/2 cup Naturegg Simply Egg Whites, 1/4 teaspoon salt and a pinch of pepper. Add remaining ingredients listed under each flavour except for the cheese (1. broccoli, 2. pesto, 3. ham and green onion, 4. spinach and roasted red peppers). Cook and stir constantly over medium heat until cooked but not completely dry. Remove from the heat. In a clean pan lightly sprayed with non stick spray, add one small tortilla. Sprinkle with half of the cheese, top with the egg mixture, and sprinkle with remaining cheese. Top with another small tortilla. Cook on medium heat until lightly golden brown, 2-3 minutes. Flip and cook until the other side is lightly golden brown, about 2-3 minutes. Remove from heat, slice and serve. Repeat with remaining 3 flavour variations as desired. 1/2 cup Naturegg Simply Egg Whites equals approximately 4 egg whites. How do you store and reheat these? I don’t see any directions for that. Sorry! I’ve updated the blog post with additional tips.